The workshop has been held on the current status of PVT collectors and systems, taking place in Freiburg on May 16th prior to the first experts´ meeting of IEA SHC Task 60. The seminar aimed to give an update on recent developments in the field, exchange on relevant projects and R&D results, and discuss best practice examples of PVT systems, where PVT collectors are viably applied. The topics have beens presented by experts from different research institutes and PVT companies. More than 50 experts from science and industry attended. In the afternoon, a technical tour was held with the possibility to visit the test laboratories of PVT collectors at Fraunhofer ISE and the PVT collector field at the New Technical Town Hall in Stühlinger (to be confirmed). The international seminar washeld in English language. The seminar is open to the public and both task members and other interested stakeholders from research and industry were welcome. Registration was done via aregistration link. The ticket fee included participation at the workshop, wifi, refreshments, and lunch at 35 EUR/Person. The workshop showed that PVT systems have become a market reality and that there are several start-ups and specialised manufacturers offering products covering a wide range of applications, including residential, commercial and industrial sectors. Most of the PVT collectors, though, are unglazed panels (with no transparent cover) and used in combination with heat pumps, but some are typical glased collectors and there are even some examples of concentrating solutions. The collectors can be classified into three main categories according to the temperature range foreseen for the produced heat: low (0 to 50 °C), medium (30 to 80 °C) and high (up to 180 °C). 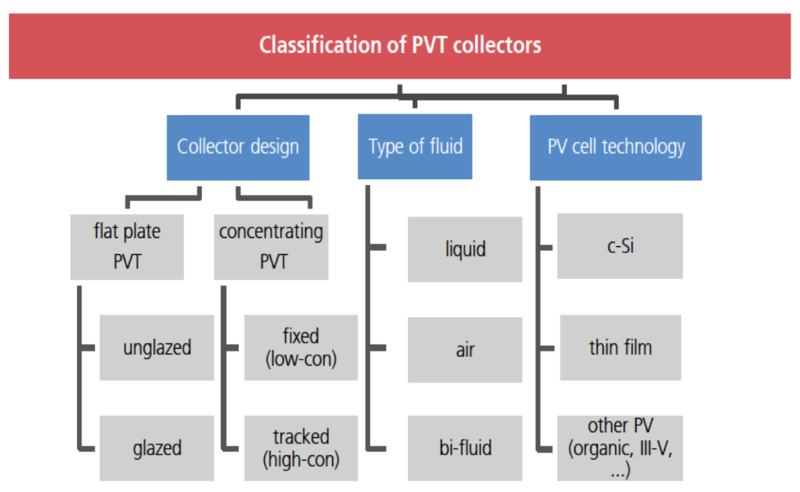 Classification of PVT collectors (source: Fraunhofer ISE, Task 60) was done. The number of manufacturers active in the PVT sector is continuously increasing. As reported by Corry de Keizer from the Dutch Solar Energy Application Centre (SEAC), 54 different PVT modules were currently on the market in Europe, and additionally 6 are under development. “Such an astonishing figure witnesses that innovation is on its way in the PVT growing community, but also that some volatility is likely to be observed since the PVT market maturity is still ahead,” summarises Jean-Christophe Hadorn, Head of Task 60. The report PVT Benchmark published in March 2018 by SEAC lists the active suppliers with a product photo and their website, but additionally identified 32 companies that have stopped offering PVT solutions already. De Keizer emphasised that several PVT research activities were carried out in the Netherlands starting from the 90’s, but with very little commercial success. The renewed interest in PVT, then, was mainly linked to the high demand for new solutions for net-zero energy buildings and, at the same time, the bad reputation on gas caused by the earthquake in the north of the country connected to the natural gas extraction in August 2012. The SAEC benchmark report identified an average price of 300 EUR/m2 for PVT technologies. This is about 10 % less than the price for purchasing separated solar thermal collector (220 EUR/m2) and PV panels (120 EUR/m2). The Dutch survey also highlighted the main technological barriers for a wider PVT diffusion: The complexity of system design and installation, the difficulties in optimization and the reliability in the long term. Furthermore, standards are still lacking to support the industries to convince customers and installers. The presentation by Manuel Lämmle from Fraunhofer ISE highlighted main research activities for developing novel PVT concepts with increased performance. The first area is aiming at enhancing the internal heat transfer of PVT absorbers for lowering the PV cell operation temperature, thus increasing its conversion efficiency, and of course for obtaining higher values for the thermal efficiency. Results show that, through direct lamination of PV cells on metal sheets without any additional layer of glue or insulating air layers the internal heat transfer coefficient can reach values between 80 and 126 W/m2 K, while glued absorbers report values between 20 and 30 W/m2 K (see chart above). The second research activity has the objective of increasing the performance of glazed PVT collectors through low-emissivity coatings. The results show that a reduction of radiative heat losses by 80 % is possible, thus improving the thermal efficiency. Of course, such an improvement also has some side effects, such as a reduction of the electrical efficiency (around 3 %) and an aggravation of the overheating problems.